214.823.2861 To make your Appointment Today! Life moves fast! It’s amazing how everyone I come in contact with is always in a hurry. They are in a hurry to get to work, a hurry to get their coffee, a hurry to get their kids or even in a hurry to get home. Because life does seem to be moving so quickly, it’s important to try to slow down every now and then and to take some time for you! 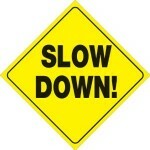 Slowing down and taking time for you can help with your stress and anxiety level among so many other things. So how do you try to slow down in this busy age? Here are a few ideas. Take a few minutes in your car! If you are like me, you probably spend a lot of time in the car. No matter what the situation, if you are alone or with little people in the back seat, take a segment of your commute to turn the radio off, turn distractions off and to listen to the sweet noise of silence for a few minutes. Take a few deep breaths and enjoy the sites where you are driving. Please be safe in your car, but it’s OK take a few minutes to mentally calm down. Be intentional about time for you! There are only 24 hours in the day. Sorry, we don’t get more. Take 15-20 minutes, possibly before bed at night, after dinner, during your cup of morning coffee, or whenever to reflect on all that you are thankful for. There are so many things to be thankful for! Some things that come to my mind are the weather, my friends, and my pets. Whatever it is, take a moment to be grateful and to focus your mind on positive things! It’s OK to say “No”. If you tend to take on too much and say “yes” all of the time, try to say “no thank you” to something! Use the extra time to call an old friend or have an extra cup of coffee or tea. It might be nice to not have a few minutes of your day un-scheduled. Schedule a “date” with yourself! If it’s hard to get a few moments in here and there, look towards the weekend and take a day for you. Sleep in late, do something you love, go for a run or walk, have a treat from the local bakery, celebrate YOU and all that you do in this life! Being able to have some you time and some moments of quiet during the day is beneficial for your well-being, your stress and your emotions in general. **Please note: This content should not be taken as an official diagnosis. If you have any questions or would like to learn more about the topics discussed, please contact Joyce Kay Hamilton to schedule an appointment by visiting https://joycekayhamilton.com/contactappointment/ or calling 214-823-2861. Ms. Hamilton is listed with the Therapy Directory and has answered questions from potential clients. Ms. Hamilton is associated as a psychotherapist to handle behavioral and/or mental health needs at the following physical therapy clinics. Copyright 2015-2018 Joyce Kay Hamilton, MLA LPC. All Rights Reserved.